Amateur prospecting has gained popularity over the years, especially the last ten years. 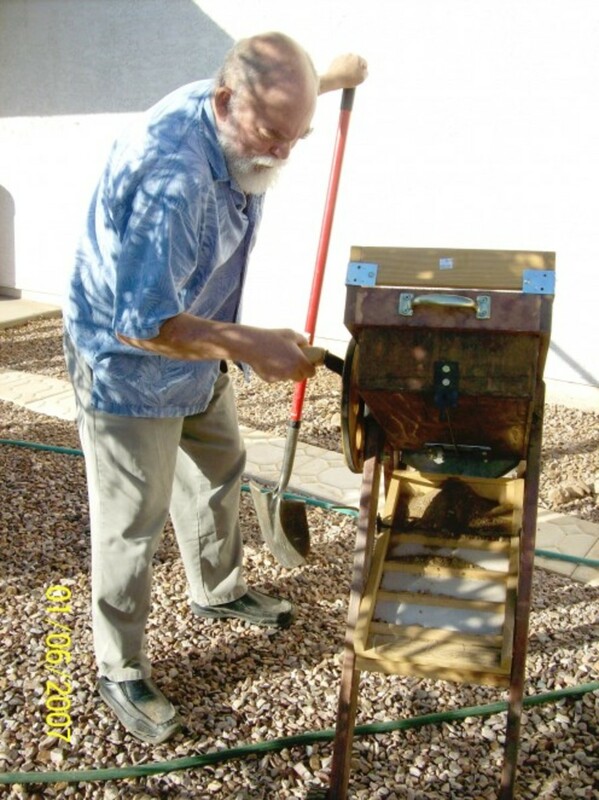 The search for gold is inspiring many people, young and old to seek their treasure. Treasure hunting and prospecting clubs have popped up all over the country. You can understand why individuals, unlike commercial miners, want small and light-weight tools to dig for and process gold bearing dirt. Most people are hiking into remote areas that have been claimed. 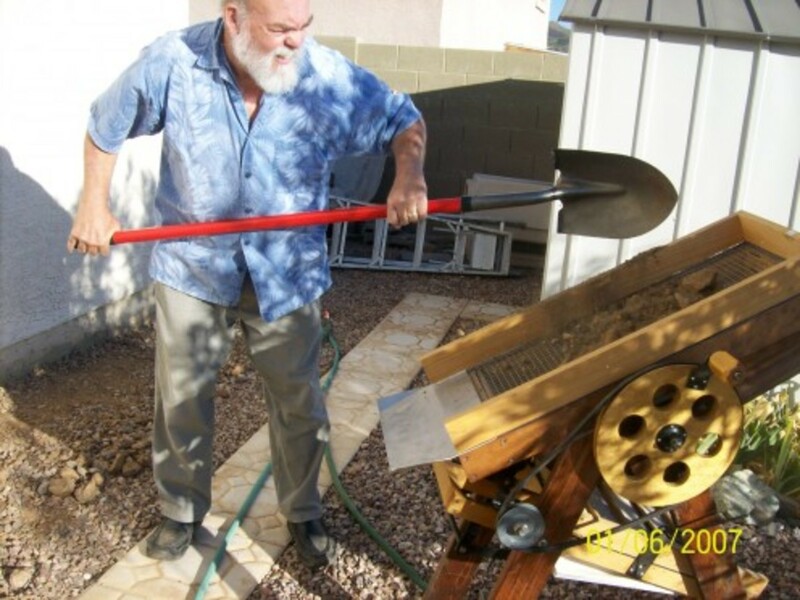 In my particular area in Arizona, there is nothing worse than toting a very heavy piece of equipment while looking out for large rocks, rattlesnakes, Gila Monsters and other cousins. Besides, a person uses up plenty of calories once on site digging and sometimes powering processors. 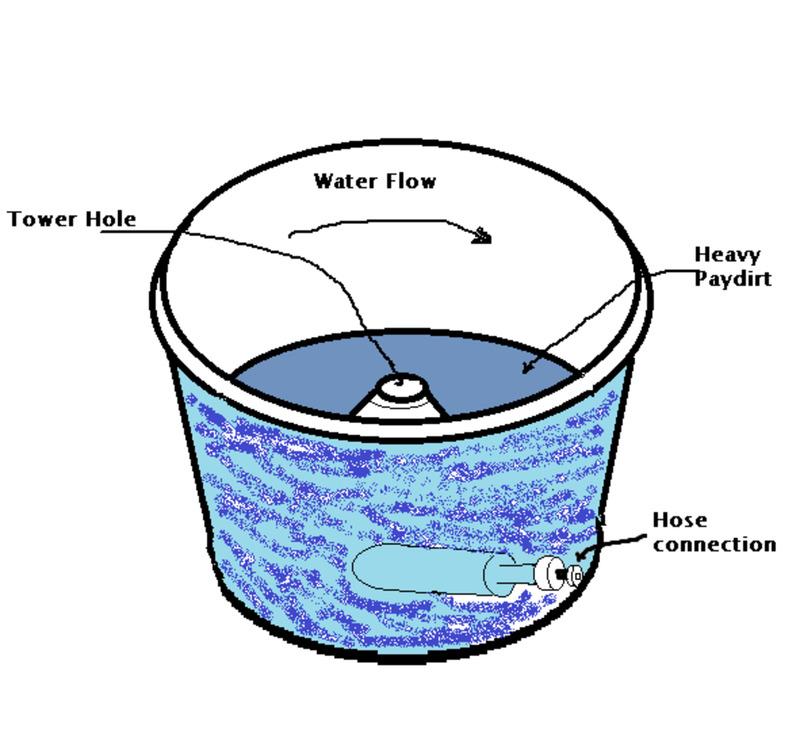 This hub will explain how a dry washer works. I believe even the average reader will appreciate how simple, yet ingenious the dry washer is. The dry washer is an invention resembling some sort of medieval or renaissance machine, perhaps even associated with torture! The first part of the machine located at the top is a hopper box. It is covered with a screen (in my case 1/4“) through which dirt is thrown. Each shovel full I'd “classified” (separated) into material devoid of rocks or pebbles larger than a quarter inch. Weeds and other organic matter are filtered out, also. I always like to look at rocks that fall off after each shovel full just to make sure I haven’t missed a gigantic gold nugget. Having classified tons of material over the years, I have found no such nugget, but I still have dreams about it! Many people like to wave a metal detector over the rocks that pile up on the ground in front of the machine just in case. This gives real meaning to the expression “gold is precious”. Also, notice the sheet metal chute that helps guide the rocks out away from the machine so they don’t pile up right at the legs. 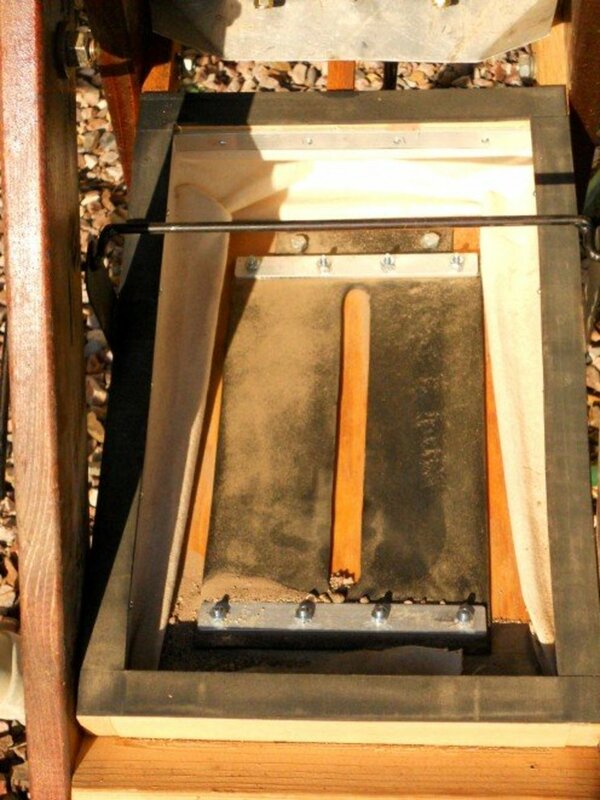 At the back of the hopper is a rod which when pulled opens a trap door and allows material to fall onto a riffle box. A riffle box is simply a rectangular tray with small rails periodically placed across to slow material being jostled down. 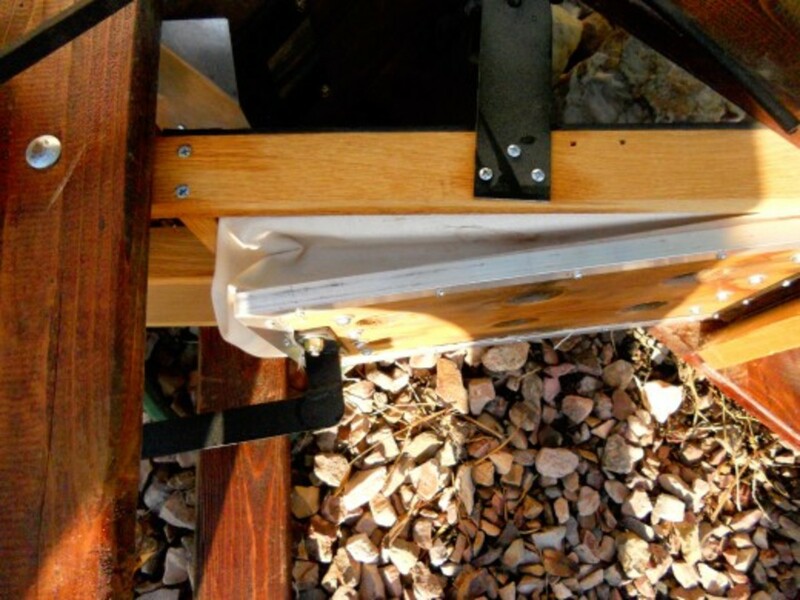 As a bellows below is driven up and down it taps the box and blows air against and through cloth that makes up the riffle box bottom. Why? 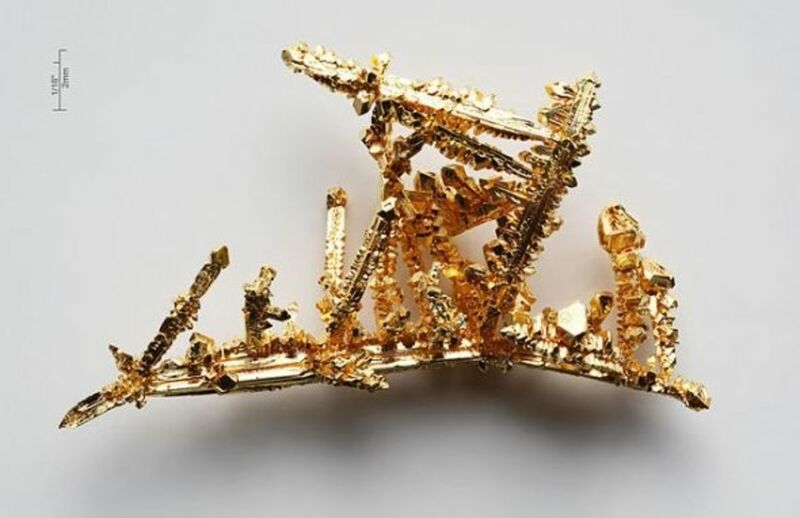 Gold is heavy (19 times heavier than an equivalent volume of water). When it hits a riffle it will sink and stop. By the time the material hits the bottom riffle, 98% of gold flake has been trapped behind the riffles (or so claim most commercial outfits who make dry washers). 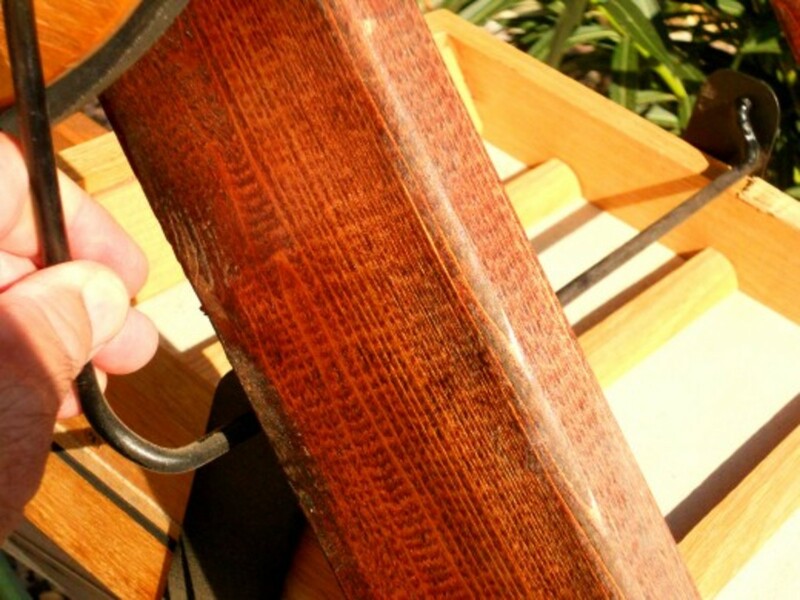 Once the material behind the riffles is all that is left, it is time to empty the riffle box. The gold is in this dirt. In the photo to the right, a black bar straddles the riffle box. When down, it keeps the riffle box from falling out. 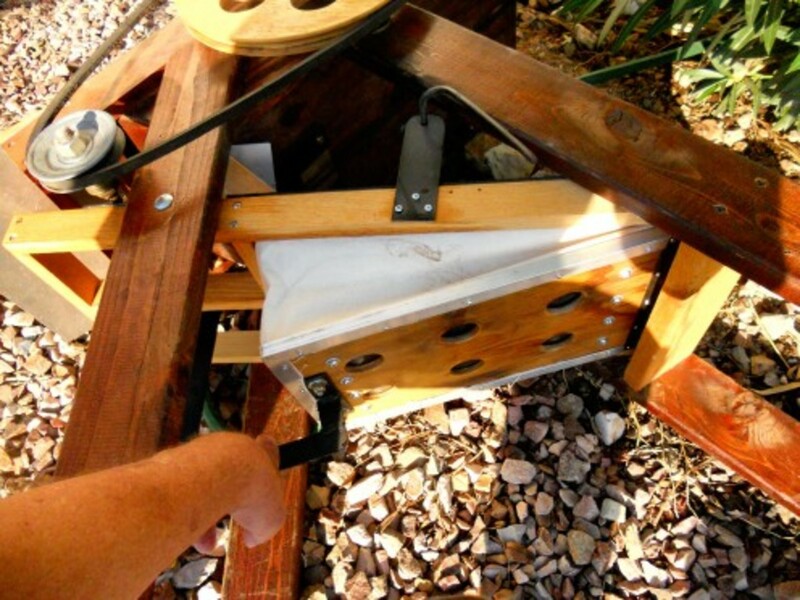 When up, it allows the prospector to remove the riffle box with the gold bearing material. Why go to all this trouble to dry wash the dirt? Because you are trying to separate “the heavies”. 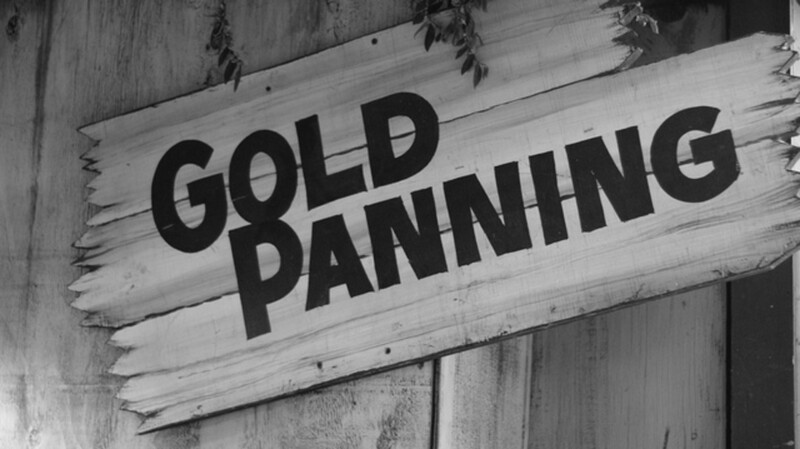 If you have ever seen a portrayal of 19th century prospector (the Treasure of the Sierra Madre comes to mind) kneeling or bending over a stream panning for gold, you can imagine what your knees and back feel like after panning for hours. Most of the material those early prospectors washed out of their pans has already been eliminated by a dry washer. So the only reason for the dry washer’s existence is to cut down on how much panning with water you must do. To give an example, I recently dry washed twenty (20) five gallon buckets of material. By using the dry washer I isolated 1/2 of a 5 gallon bucket with heavies. So, you can see, panning with water just 2 1/2 gallons of material instead of 20 gallons is saving your back quite a bit of strain. Heavies can consist of mercury, hematite, magnetite, lead, small quartz pebbles, and other heavy minerals. Oh, don’t forget the gold! See the photo of emptying the riffle box. 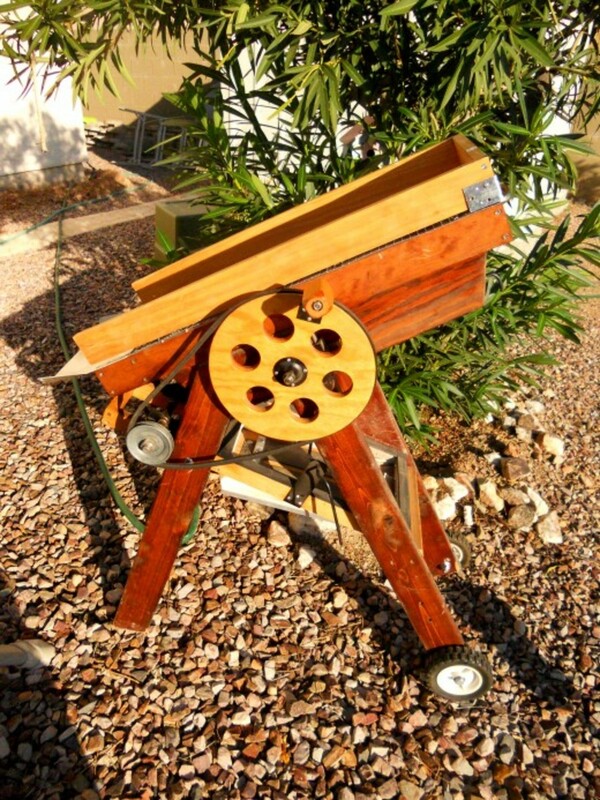 Most dry washers today are built with electric motors which drive the bellows under the riffle box. To keep them light, they are frequently made of aviation aluminum and are made with folding legs, hopper, and riffle box. My dry washer is designed to be cranked manually by a human. In using this type of dry washer, I don’t have to use a battery and motor. The down side to this is that being built of wood it is heavy. Also, it does not fold up, so is awkward in very rough terrain. At the same time, I don’t require a battery and motor which weigh. Many dry washers with motors run $500 to $600. Mine cost about $200. There are both pros and cons to everything. There are many places I can’t go with it. Sometimes I carry buckets of dirt where I left the dry washer near my parked truck. I process the material right there. Why? Because before I got my dry washer, I brought my concentrate home in buckets and panned in the back yard. At one point the dirt pile I was building got so large that it encroached on my wife’s roses! The neighbors thought we had big moles living in the yard. When your wife and the neighbors are concerned about your sanity, it’s time to get a dry washer! The V shape of the machine enhances the flow of dirt down the machine. Some people think that this design looks weird. When I first saw one in action I thought the noise and bellows motion meant the thing was about to take off! The pulley and belt drive is connected to a crank lever under the bellows.That’s what pushes the bellows up and down. All you do is grab the crank on the pulley and start turning. Adjusting the shaft at the top near the hopper controls the dirt feed onto the riffle box. Pull and it opens a trap to let dirt through. Shove the shaft forward and it closes the trap door. 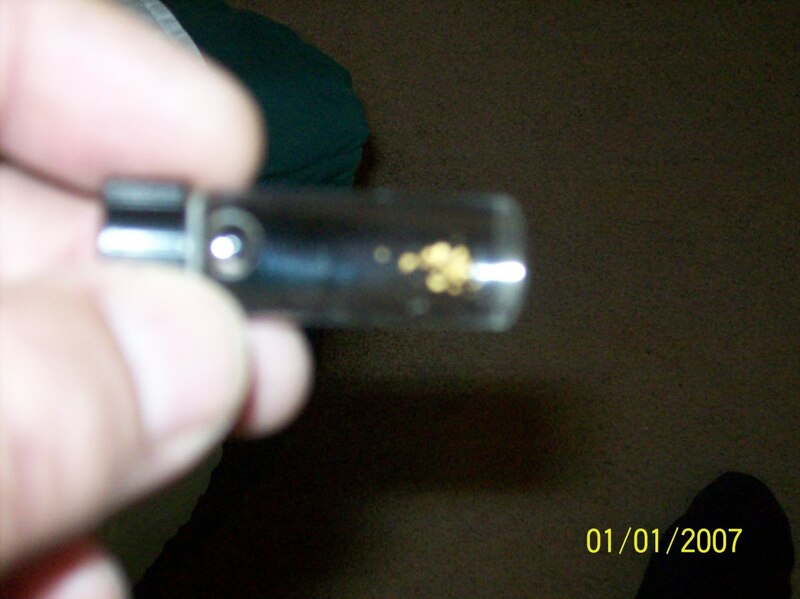 With gold selling for around $1700 an ounce, more and more folks are interested in collecting gold placer flake. These people are not interested in hunting for a gold vein (stringer), an out-cropping somewhere, or blasting to discover a lode gold bearing area. They are content to dig river beds, streams, dry washes, ancient waterways now dry, and arroyos, where flake has been deposited from mountains higher up. Since gold is soft, it flakes off pretty easily. The mountains send gold particles down as the rainwater runs over them. If you want exercise in the outdoors and if you would also enjoy the camaraderie of club fellowship, and if you have a little gold fever, I highly recommend finding a treasure hunting club in your locale. Google GPAA. There you will find clubs in every state in the U.S. There are some clubs that are not affiliated with Gold Prospectors Association of America, but GPAA has the most clubs and it is at least a starting point for finding others with your interest. And, by the way, I haven’t found a cure for gold fever, yet! I have been intrigued by a rather new version of the dry washer that has come out by Keene. The reason being that a dry washer is necessarily dusty. 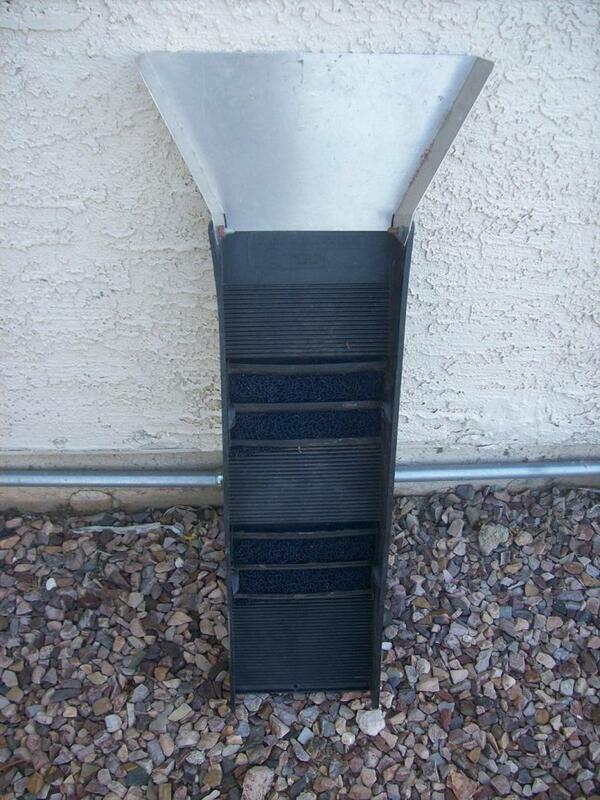 A blower puffs air up to vibrate a riffle box up and down. 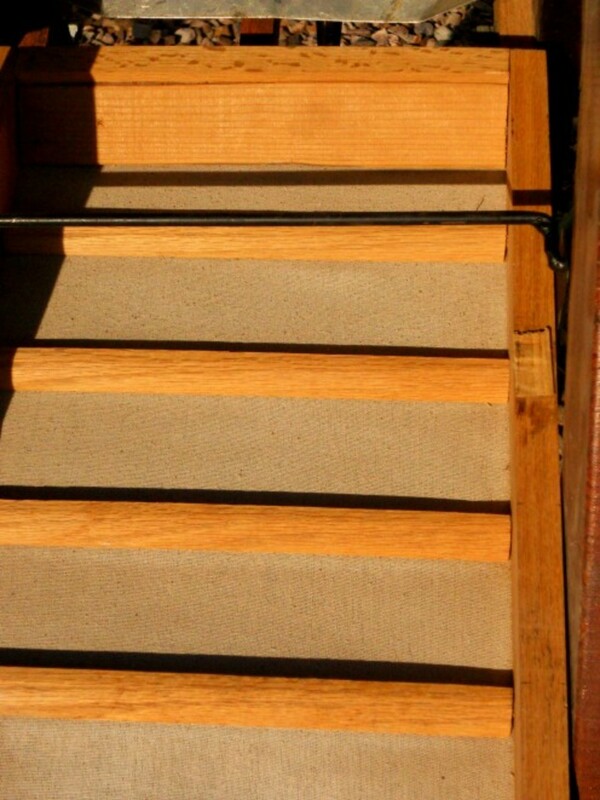 This action then blows the light weight material away from heavies and allows non-gold bearing material to slide off. Gold material stays behind the riffles to be unloaded and panned later. But this presents a bit of a problem for folks with respiratory problems. You can try to stand upwind, but the wind changes directions easily in a wash in Arizona. Folks with those breathing problems should wear a mask, but may be more sensitive. Most folks wear masks anyway when using a drywasher. Now there is a new machine that is a drywasher and high banker all in one. It is light and space-saving. This is extremely helpful when trudging across rough country with limited access. Its net weight is 29 pounds. 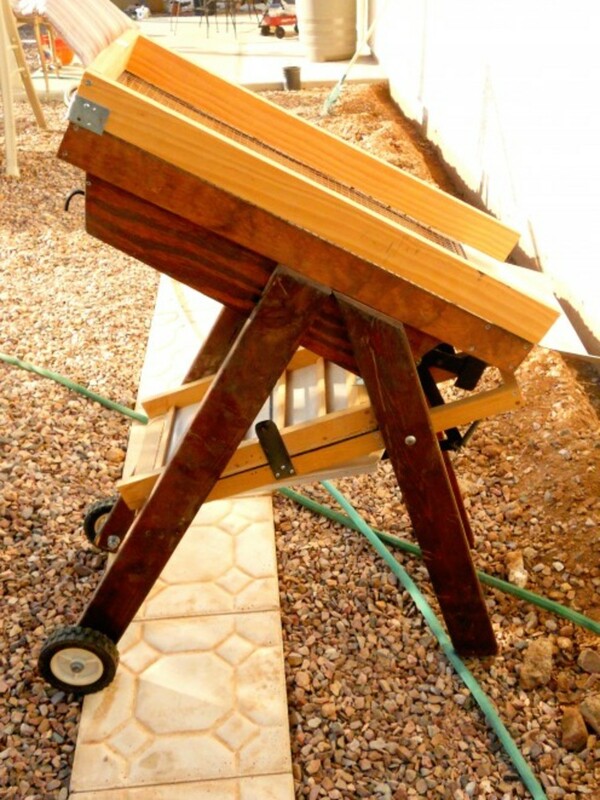 This unit makes the necessity of washing only dry material moot. If the material is wet, you can use the highbanker. Another claim to fame is fine gold recovery with a dustless operation, perhaps the machine for someone with asthma who wants to prospect. I have seen this machine operated at gold mining shows and I was impressed. I still can't afford it, but I was impressed! What piece of equipment do you use most when you prospect? You're right! Wet/damp ground makes a dry washer useless. 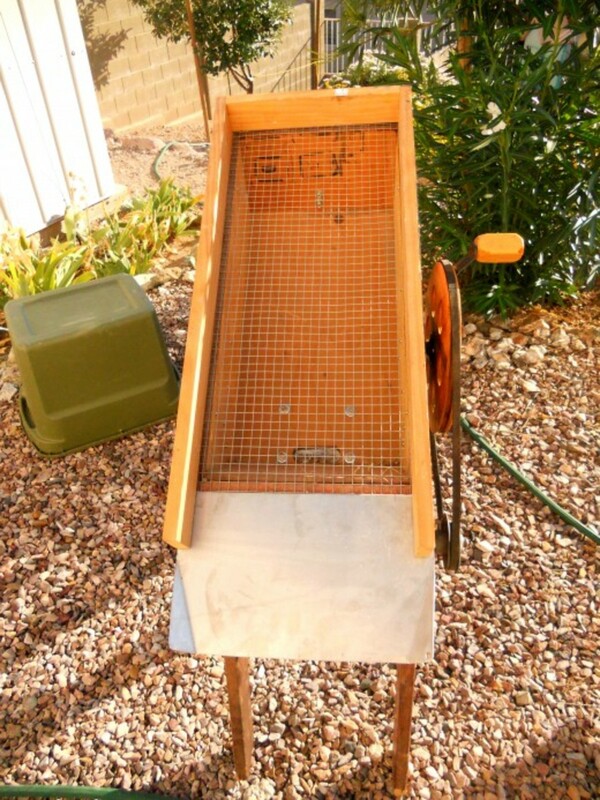 I have on occasion tried winnowing - tossing a bit of damp dirt in the air repeatedly to dry it out. It kinda works, but it involves more time and less material than a shovelful in the flare. I do this only when I am sure the sand in my wash is dry and find out it is a bit damp, much to my surprise. Usually I just go back to my pan and buckets. Nice story. 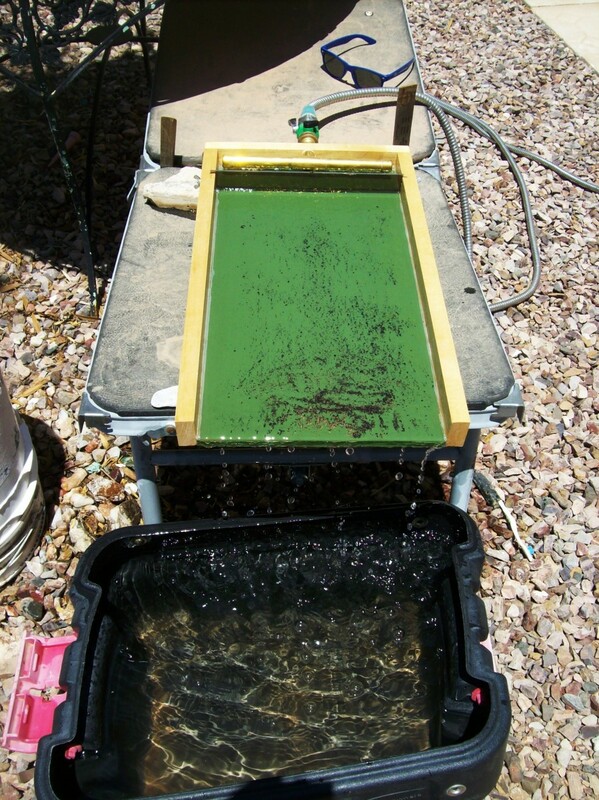 Making any money with placer gold usually means processing a lot of material. The more you process the more you get - I think your father must have known the area already. Usually you have to test pan in several different spots on a claim to find a deposit of flake before loading up the dry washer. I too was skeptical of how well the dry washer would work, but I am convinced now. Thank you for the comment. Interesting and brings back some nice memories. 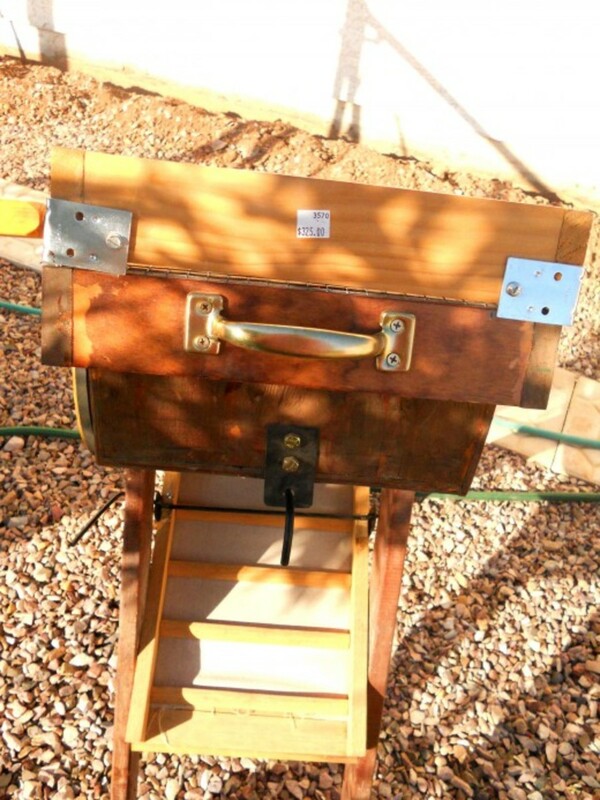 My father lived in New Mexico and once when I went to visit, he took me up into the hills with his dry washer. We shoveled about 20 five gallon pails of dirt through the thing to get one 5 gallon pail of "concentrates" he called them. I was skeptical but we retrieved a small vial of gold just like you show when we water panned the concentrates back at his home. Thanks for writing. Ancient waterways are a great place to seek the gold. Many folks look at old maps and analyze the geography to determine where water used to flow. Helps to find an old waterway again that was out of the mountains. That's not the only place - there are plenty of areas with nuggets and such away from those kinds of channels, but if you have a choice in the beginning, an area near old waterways is great. If I lived there I would go after it! Thanks for the comment. Very interesting. I've always wanted to try panning, and who knows...I might start right in my own backyard; where we live used to be underwater centuries ago...and the river still flows only about 4 miles away...worth a try, eh? ;-) And--free to get there, beside--no cost for gas! Wow! I have been searching for the shiny stuff for a bit over 3 years and haven't come anywhere near that. How exciting to to do that. I have heard there is some nice gold in North Carolina - also Tennessee. I also go for fun primarily, that way I am never dissappointed. Now you have the fever! It's a disease that can't hurt you in my opinion! Thanks for the comment. Pretty cool machine. I've seen a large mechanical one but never used it myself. I go panning in North Carolina and sort of combine it as a camping trip. 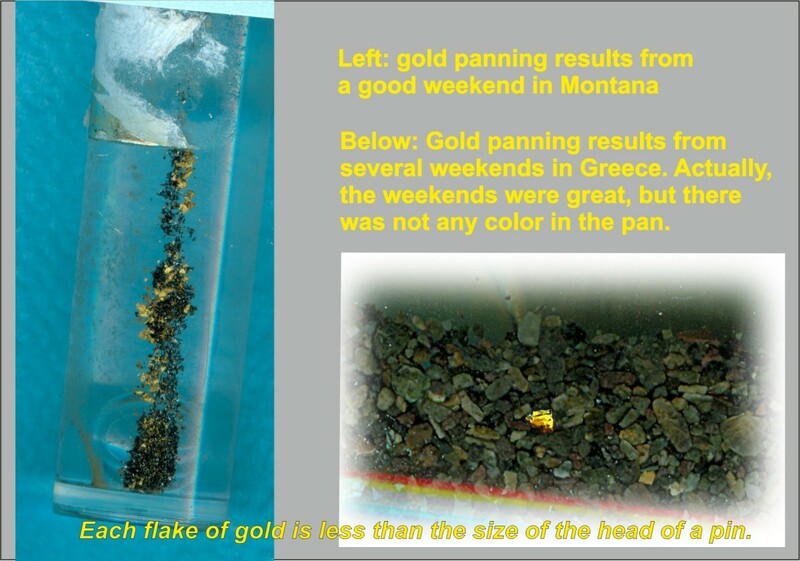 I got hooked on it about 6 years ago, my first time panning, and all together we found about 1.5 oz of gold over the course of 4 days.... Yes there was a lot of buckets and a lot of water. Fortunately there was a panning station incorporated at the campground. 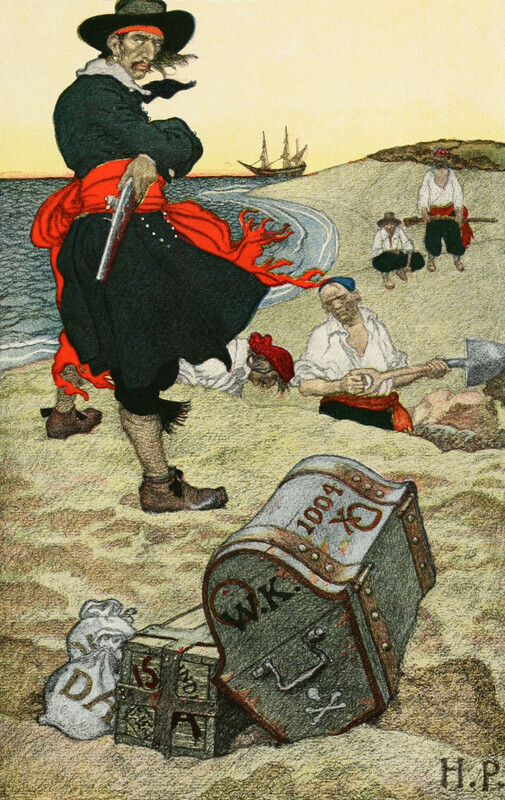 We didn't go to find treasure, we went because it was fun. Thanks for the hub.